Anyone planning for marriage usually has a long list of wedding itinerary to take care of for everything to run smoothly. Like any other ceremony, you need to ensure that your guests are served with the right food and that they leave satisfied. The secret to getting this objective right is to outsource catering services. Here are some benefits that come with outsourcing catering services. Caterers, having been in the catering business for some time, understand what it takes to feed hundreds of guests. In light of this, they are in an excellent position to advise you on the best foods for your wedding. They also help you customise the food options served depending on your budget. If you are hosting some special groups such as allergic persons or vegetarians, professionals can help you plan the menus accordingly. Making large portions of food and ensuring the quality is right is not always easy. A wedding is not one of those occasions where you might hire a family friend to prepare the banquet; you need professionals who are up to the task. Only professionals have what it takes to give you consistent quality. Catering is not just about serving quality foods; you need to think about the presentation. It is critical to ensure that your presentation blends well with the décor and the overall theme of your wedding. Without the right display, the formality of your wedding can be compromised a great deal. The only way to get the presentation right is by enlisting the services of a professional caterer. Outsourcing catering allows the bride and groom to focus on their wedding. On the contrary, failure to hire catering services means that you should be prepared to run up and down or deal with some disappointments arising from catering shortfalls. 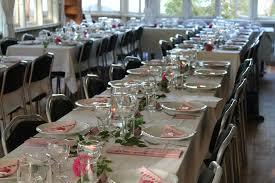 This is to say that outsourcing catering services is essential to the success of any wedding.